Front row, left to right: Celeste Mata, Sabrina Ramon, Alexis Culver, Persephone Walsh, Anissa Morales, Kaelyn Lara, Adrianna Calvillo, Maximus Rodriguez, Gaylen Garcia, and Noah Gilkey. Back row, left to right: Emily Schultz, Victoria Martinez, Joseoph Helton, Isaiah Helgeson, and Christian Flores. Natalia High School hosted the 3A District 30 UIL Academic Meet on March 27th and 28th. This is the 2nd year in a row for Natalia to host the contest for their district. This year Natalia had a total of 29 students compete for their school academic team. Coaching this year’s team for Natalia were Anajali Dandona, Lisa Gorman and Candace De Jesus. 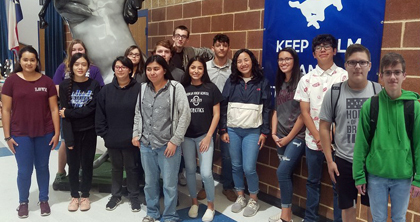 Their students brought home 32 medals and 11 students from the high school will be competing in the Regional UIL Academic contest at Texas State this coming Friday and Saturday, April 12th and 13th. In two of the toughest contests, Science and computer Science, Natalia captured the 1st place Team Gold medal. In the Current Events and Issues the Natalia team captured the 2nd place position to bring in the team silver medals. Following is a list of all medaling contestants. We had two students medal. Sabrina Ramon placed 4th and Joseph Helton placed 5th. They along with their team mates Isaiah Helgeson and Adrianna Calvillo placed 3rd as a team. Sabrina Ramon will compete at Regional. We had two students medal, Gaylen Garcia with 4th place and Nicholas VAsquez in 6th place. Noah Gilkey medaled with 4th place. He and our Natalia team made up of Kendall Tanner, Celeste Mata and Lauren Rizo placed 4th as a team. The team made up of Kaelyn Lara, Anissa Morales, and Noah Gilkey took the silver second place medals and are the alternate team for our district. Maximus Rodriguez placed 3rd and Alexis Culver Placed 4th. The team made up of Sabrina Ramon, Joseph Helton and Adrianna Calvillo placed 3rd as a team. Sabrina Ramon took the silver medal in 2nd place and Joseph Helton took the bronze in third place. The Natalia Team made up of Victoria Martinez, Sabrina Ramon, Isaiah Helgeson and Celeste Mata, coached by Candace De Jesus, brought in the first place Gold medals to advance as a complete team to Regional. Taking home overall individual medals were Victoria Martinez as the 1st place gold medalist, Sabrina Ramon as the 2nd place silver medalist, Isaiah Helgeson in 4th place and Celeste Mata at 8th place. The Natalia Team made up of Emily Schultz, Isaiah Helgeson, Joseph Helton, Christian Flores, Adriana Calvillo and Reese McDole coached by Anjali Dandona took the first place Gold medals to advance as a complete team to Regional. Taking home overall individual medals in science were Emily Schulze at 3rd place, isaiah Helgeson at 4th place, Joseph Helton at 5th place, Joseph Helton took the gold medal in Biology at 1st place, and Isaiah Helgeson took the silver medal at second place. Isaiah Helgeson got second in Chemistry. He tied for 1st place but lost the tie breaker. Emily Schulze tied for first place in Physics. She and another student tied again in the tie-breaker so they will share the first place designation. As the alternate, Persephone Walsh will be competing with her team mates at the contest this weekend as one of the team members will be unable to attend.